information to individuals and families in affected areas. code” 898-211 has long been established, as having texting protocols for many Centers. services and information delivery during disasters until 2017.
protocols for system and service continuity as well as, end user safety. coverage became an issue during these events. where they could find resource information and how shifts would be scheduled. were pushed out through multiple media channels. Establish UWW as software administrators to coordinate the NTP. 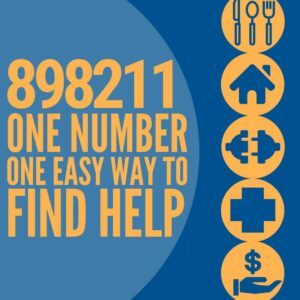 Reach out to current users of 898-211 to identify available volunteers. Offer just-in-time virtual training to volunteers. Add volunteers to texting queue so they could respond. Scheduling volunteers in 2-hour shifts, 24/7. Provide scripts and canned messages to volunteers for their response. Develop a website for resource information. the services did not always match where the need was coming from. Program and to learn about Disaster SNAP. is now pre-configured for the next ED event based on the lessons learned in 2017.
difference with measurable impact in communities.